This is just a quick reminder that Saturday, May 3rd, is free comic book day. 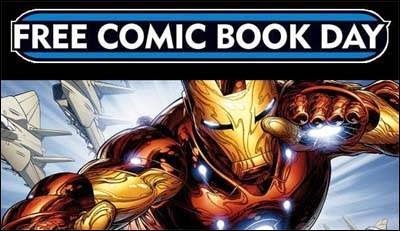 This is the day that comic brands distribute specially created editions of select titles and give them to Comic Book stores to distribute freely to customers who show up. Usually, there's a limit to how many comics a store will hand out to an individual, even though they may have more free titles than they give you. So be aware. Maybe be tricky. Unless you know your Comic Book dealer. AND sometimes, Comic Book stores have other special incentive sales that coincide with this freebie day. One year a buddy of mine snagged some great Iron Man figurines. BUT you have to get there early. As in, maybe, "when they open" early. At least that's what has worked for me in the past. Unfortunately, I won't be able to partake because I'll be at a competition with my dog, Vader... the Bark Lord. Here, let Stan Lee tell you about this great day!